Mid-century Cronin China blue Tulip serving dish. There is a wonderful vintage shop in downtown Ft. Myers. I never miss a chance to visit the shop when I am lucky enough to be in Florida. I always find a treasure there, and on one visit I snapped up the square serving dish in this photo. It became my go-to piece to heat food in my toaster oven. The winsome tulip motif and color combo always makes me smile. 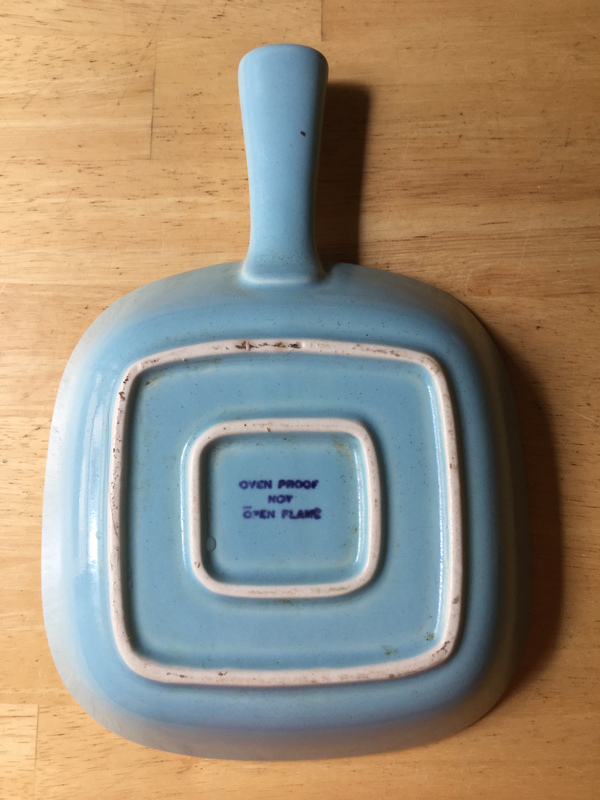 The back is marked “oven proof not open flame.” Years later, on my lunch hour, I found a teapot and a little covered soup dish to match, adding more happy dishes to my small collection. They are unmarked, but I learned that these mid-century pieces were made by an Ohio company called Cronin China and there are many more pieces in this blue Tulip series. There are even sets that have a yellow background color instead of the turquoise. The grocery store, A&P (which I remember from my childhood in Ohio during the 1960s,) gave these out for in-store promotional premiums. Some say that the Tulip pieces that are usually attributed to Cronin China were actually made in West Virginia by Cameron Clay Products. Does anyone out there know more about this? I collect the Cronin China Blue Tulip pattern china. I have most pieces that were made, but am still looking for a few hard to find pieces. I am told that there is a coffee cup, bowl and cookie jar. I have seen the cup and bowl, but they were priced way out of my range…$200 plus for each one. If you have any other info about this pattern, I would greatly appreciate it. Thanks! I never saw a covered soap dish. Could you send me a picture of it? The covered soup dish I was referring to is actually in the top right of the main photo in this post. That’s so cool that you collect this pattern. I hope you luck out one day and can add the missing pieces without going broke! I only have the pieces shown in this post, and what I wrote here is all I know about it so far. I will certainly be sure to inform readers if I learn more about the Cronin China Blue Tulip pattern — and if any of you have any more info, I invite you to share it here!